Raw Food Dining NYC: Pure Food and Wine, More. 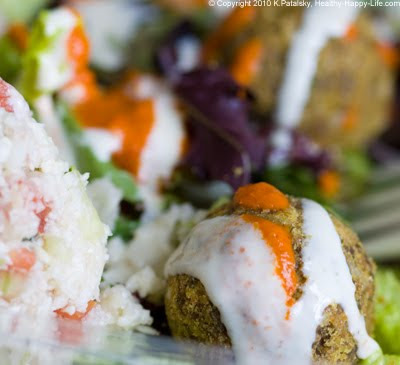 For the first stop in my NYC Dining Out Vegan Series, we're get RAW! 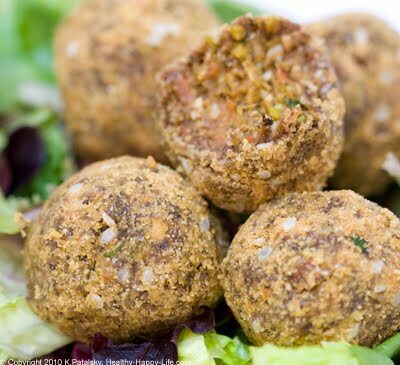 When I reflect on the Raw Vegan Food I've enjoyed in NYC, three places come to mind: Pure Food and Wine, Organic Avenue and Caravan of Dreams. * The raw avo-coco soup, almond hummus and coco-mango pie at Caravan are 100% cravable. 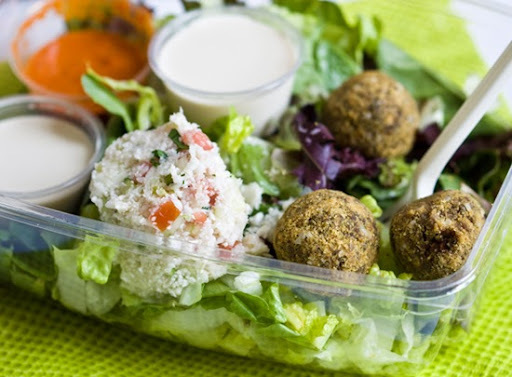 * The to-go bevies like the blueberry spirulina smoothie, light bites like the raw falafel and diverse snacks at Organic Avenue are delicious. * But without a doubt, the most iconic, inspirational, artistic and all around yummy raw vegan food in NYC can be found at Pure Food and Wine restaurant (and One Lucky Duck takeaway). Juices, smoothies, to-die-for desserts, entrees, salads, snacks and other assorted products are all a part of the PFW/OLD brand. Yes, please: Sitting out in the PFW garden enjoying a Master Cleanse-tini or fruity sangria and a bite of their signature raw lasagna is my idea of a perfect evening out. And yes, add on a mallomar or slice of raw cheesecake to finish things off. Sarma. A great restaurant is only as great as its leader, and Sarma Melngailis is one of the most fascinating, driven and entertaining women I've come across in the NYC (and beyond) foodie world. 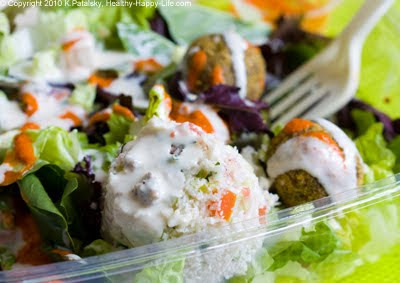 Raw food interest or not, Sarma and her brand will leave your craving more. Head Duck: Sarma. I'm a fan. Sarma is Founder & CEO of OneLuckyDuck.com, Co-Founder & Owner of Pure Food and Wine restaurant in NYC, author of Living Raw Food, co-author of Raw Food Real World. And all around super cool role mode/entrepreneur/raw foodie icon. If you're not reading Sarma's hilariously candid, touching, fun, yummy and quirky tweets on facebook and twitter, @sarma - I suggest you start! You can also get to know Sarma by reading the Veggie Girl Power interview she did for my blog last year. Pure Food and Wine/One Lucky Duck 101. Here's a quick brand 101 for the PFW newbies out there. First, there is Pure Food and Wine: the fine dining restaurant. Yet it's not "fine dining" in the classic sense. The PFW atmosphere is modern, relevant, posh, fun, cool, sophisticated and energized yet also quite chill. You can wear a fancy cocktail dress or some cool jeans. Brilliant. PFW serves cocktails, wine, a varied menu of raw food eats and even a tasting menu. Open for dinner and more recently - lunch! Bring your non-vegan friends and open their minds and widen their palates. Now just around the corner from the PFW restaurant/bar/seasonal outdoor garden is One Lucky Duck Takeaway. In this cozy cove with very limited seating you can order a wide variety of salads, entrees, juices, smoothies, desserts and even raw living and OLD brand products like adorable duck tees and totes. Skincare products, ingredients and tons of bagged snacks. Peruse the shelves, and I'm sure you'll find something unique and intriguing that you simply need to try. Mallomar. A must try. Nothing like you've ever tasted before. The combo of luscious cashew cream and chocolate is genius. Read my review here. I love it so much, I even put it on my Vegan's 100 List. Juices and Smoothies: Bunny Brew and Swan Greens. I love them both. 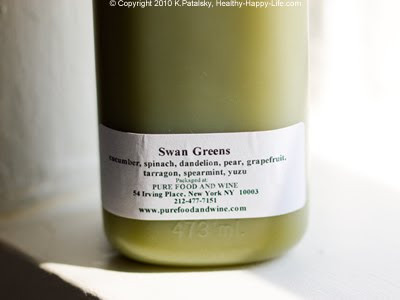 Swan Greens is a complex blend of cucumber, spinach, yuzu, pear and more.. It's refreshing in a not-too-sweet way. I always chug it and feel rejuvenated in a few seconds. I also love coconut water, so the Coconut Shake is my idea of coco bliss. Raw Cheesecake. 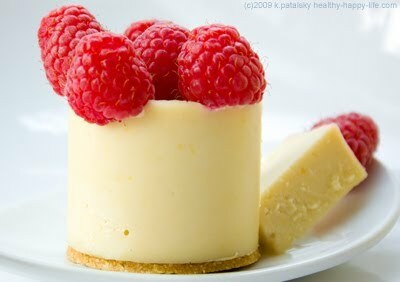 Before going vegan, I loved cheesecake, and PFW's raw cheesecake is better than the real thing. 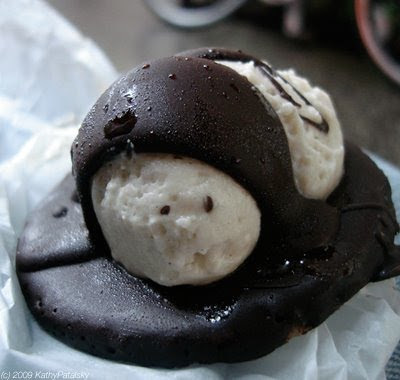 Creamy, rich, sweet and luscious. I adore it. My PFW Lemon-Raspberry Cheesecake review here. Snacks: I love many of the cookies, nuts and cracker snacks and the cocoa, aka chocolate crispies, which are kinda like raw granola are always a fave of mine. 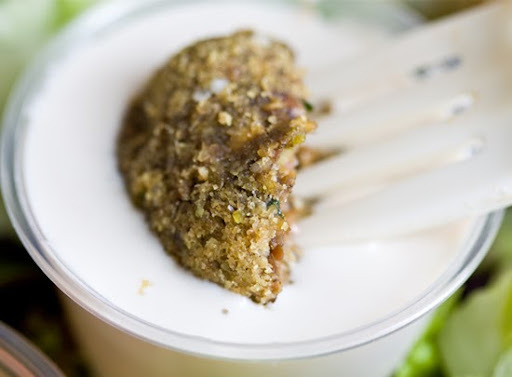 The Raw Falafel with Tabhouli Salad. With lemon tahini sauce and hot red pepper sauce. My favorite. The Tabhouli is crazy-good. 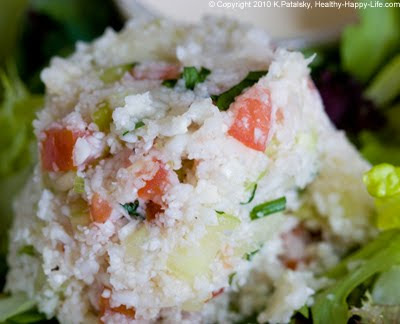 And to me it is actually less like tabhouli and more like the best creamy, light, fine cole slaw ever. The texture is amazing. I always want more of it! I love the salad: romaine and baby greens. 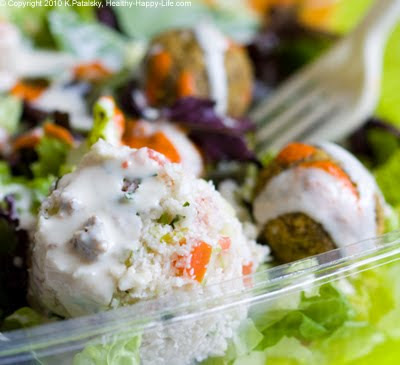 The Tahini sauce is perfect. 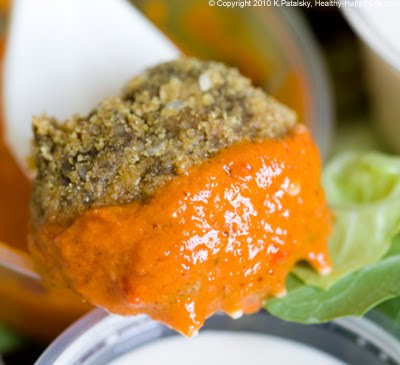 The spicy red 'hot sauce' adds a subtle spicy kick to the rich flavors. 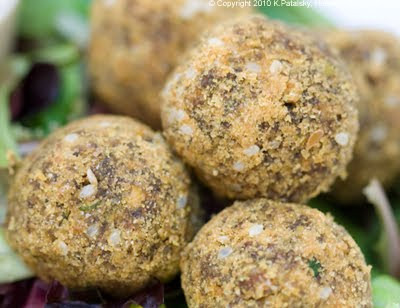 The falafel balls are the best raw falafel I've ever tried. 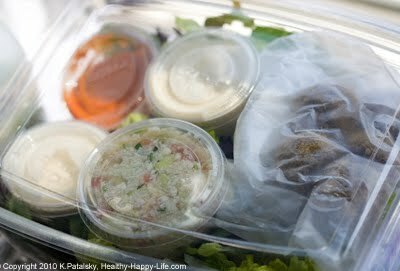 Heck, best falafel ever wouldn't be an exaggeration. Moist and textured without being the slightest bit mushy. The flavors are complex. Warmly spiced. 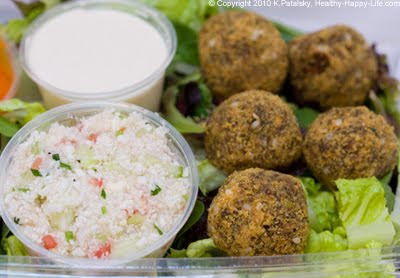 If you love falafel-themed meals - this is a must try. 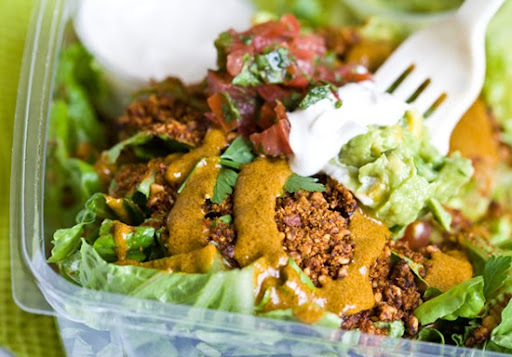 The Raw Taco Salad. 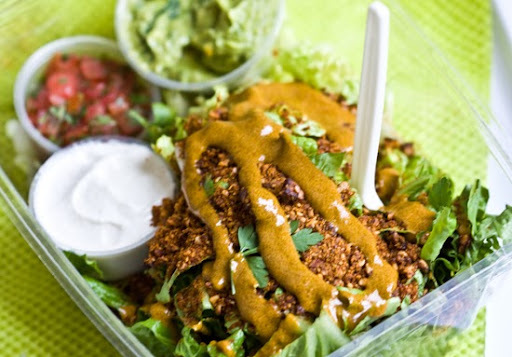 With romaine, spicy taco crumble, pico de gallo, guac, cashew sour cream and cilantro lime dressing. Chewy taco crumbles are savory sweet. 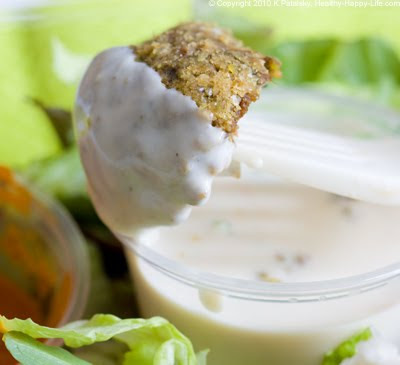 Taco dressing is rich in lime flavors - super zesty and spiced. The Cashew Sour Cream is sweet and authentic. The Guac is fresh and light with little bits of sweet corn. Salsa has a light cilantro flavor - super fresh. Crunchy romaine is the perfect base for this taco salad. Crunch, munch, yum. Pure Food and Wine restaurant website. One Lucky Duck: E-commerce store featuring One Lucky Duck packaged raw cookies and treats, both of Sarma's raw food books, and loads of other good stuff.